On January 2019 Bachata Spice Amigos moved to The Loop Bar to become Spice Amigos Mondays where we currently teach Kizomba alongside Bachata every Monday. Our Kizomba crowd is growing bit by bit and with our Super Fresh environment we are filling every week The Loop Bar until we become a reference not only in Bachata, but also in Kizomba and Urban Kizz. Our lessons are famous in London due to our “Spicy Syllabus” based in great content + Great vibes. With this system we create a genuinely welcoming environment in which our students learn having lots of fun, making new friends and disconnecting from their every day work stress. Come and join us, learn few steps with people of your level (from beginner to Master level) and discover a community that you will never want to leave. You can also check our Official Facebook Event. 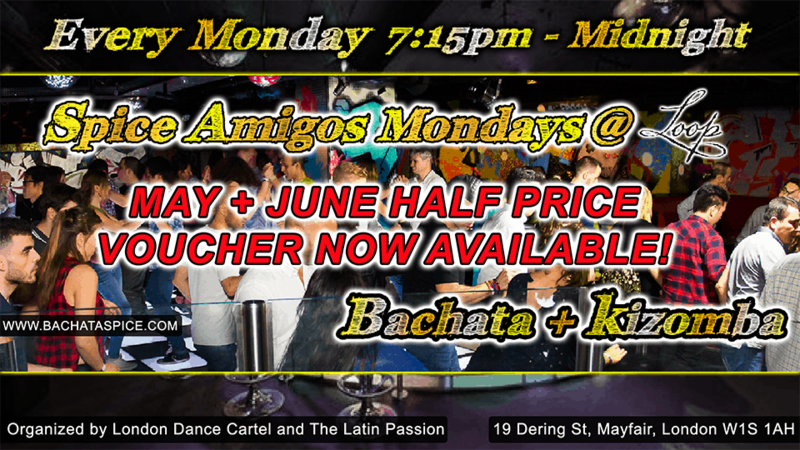 Bimonthly Half Price Amigos Voucher (Bachata and Kizomba): Pay for 2 months of lessons and safe 50% on your lessons price. Non-refundable and non-extendable. Coming bimonthly offers: January, March, May, July, September and November 2019. Spaces are Always Limited. * PLEASE REMEMBER TO BRING YOUR ID. IT MAY BE REQUIRED AT THE ENTRANCE. 19 Dering St, Mayfair, London W1S 1AH, UK.